The team at the Faculty of Education are developing a range of advanced multimedia materials to help existing teachers improve their teaching, as well as to help train new teachers. 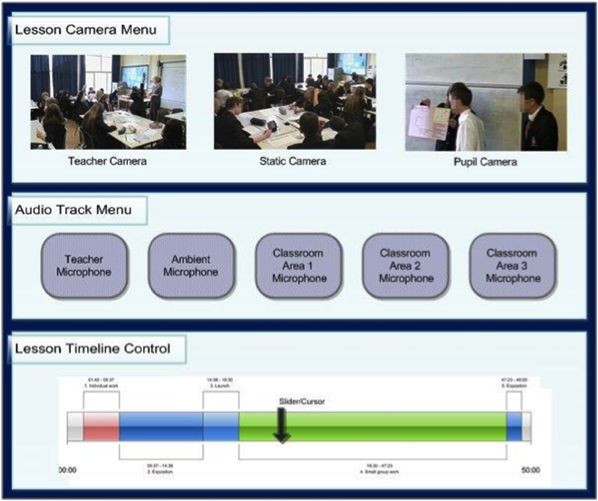 The materials will include a range of example lessons, which can be observed from multiple camera directions and from multiple microphones, thus allowing the observer to see how the teachers and pupils interact. The final product will use an interactive timeline to enable easy access to different points in time and different spatial locations within the lesson. For example you could watch the teacher speaking about a new concept, and then watch the pupils’ reactions to her words as they were being said. 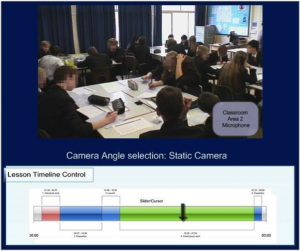 You could then see how working groups in the classroom tried to use the new concept in practice. There seems to be significant need and demand for a product like this, that will enable example lessons to be easily made available to teachers at different stages of their careers. Depending on their existing expertise, different teachers may well want to observe different aspects of the same lesson. It is recognised that there are significant challenges in fostering meaningful and lasting changes through teacher professional development, and one of these is the core difficulty of observing fully the dynamics in multiple different classrooms in a variety of situations. A classroom is a complex social situation, involving teacher-pupil, pupil-pupil and in some cases teacher-teaching assistant interactions on a number of levels. The teacher needs to deliver information in an engaging way, while constantly monitoring the attention (or lack of it) of 30 children, and the interactions between them, as well as trying to assess who has understood and who needs further support and explanation. The researchers have developed significant know-how in how to best record these interactions so that they can be used at a later time in a meaningful way. As a result of this know-how they have developed a product concept, but now need market feedback to ensure that they develop the product in the most useful and valuable way. 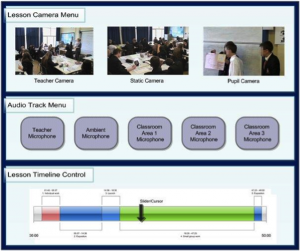 The challenge for the i-Team is to discuss this concept with teachers, teacher training institutions, educational publishers and others, in order to give feedback on how such a product might be used in practise and therefore the features it would need to have to be of most value to the maximum number of people. The product could be designed in a number of different ways, and it is important for the researchers to make the right choices at the start. The i-Team will be invaluable to making those choices. Kirkman, P. R. (2012). Secondary students’ compositional development with computer-mediated environments in a musical classroom community (Unpublished PhD Thesis). University of Cambridge, Cambridge. Watson, S. (2014). The impact of professional development on mathematics teachers’ beliefs and practices (Unpublished PhD Thesis). University of Nottingham, Nottingham.